Record Screen Activity. Record Streaming Video. 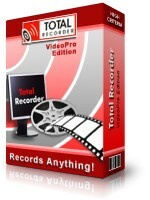 Total Recorder VideoPro Edition is a new edition to the Total Recorder product family that provides recording from any combination of video and audio sources. This edition includes all of the powerful features for working with audio as Total Recorder Professional Edition. To compare different editions of Total Recorder, refer to the Feature Comparison page. The VideoPro Edition allows you to play, record, and edit video files in AVI, WMV or FLV format. You can record screen activity, record from a video device plugged into your computer, such as DV camera, web camera, TV-tuner or DVD player, or background record Internet video streams in WMV format. The Video Add-on is no longer available beginning with Total Recorder 8.0. However, purchasers of previous versions of the Professional Edition and the Video Add-on can upgrade at no charge to Total Recorder VideoPro Edition (read more). Note. The Total Recorder Add-ons greatly extend the functionality of Total Recorder. For more information refer to the Add-ons page. Support for video files in AVI, WMV and FLV formats; in addition under Windows 7 and above in MOV (for playback only), MPEG-4, and 3GP formats. Ability to capture and record screen activity as well as on your computer, including full screen capture, window video capture, region capture, cursor movements, and menu selections (see How to Record Video from a Screen or Software Player). Record video from hardware video devices, including DVD and cassette players/recorders, USB web cameras, DV cameras, and TV tuners. For more details, see How to Record Video from Video Devices. Watch and record streaming video in WMV or FLV format. For example, you can record Internet television. For more information, refer to Background Recording (Capturing) of Video. Ability to convert a video file from one type to another using different video codecs. See also How to Convert Video. Perform editing operations on a video file. For example, you can save, cut, copy, or paste a selection. Editing of a video file is performed without re-encoding. This saves time and does not lead to a loss of video or audio quality. For details, refer to How to Edit Video. Support for multiple monitors. You can specify the monitor from which a window or region will be captured, as well as specify the monitor to be used when playing video in full-screen mode. Use the time-shift feature, which lets you listen during the recording or the background recording of an Internet broadcast. Support for video files with multiple audio streams. This feature allows you to select an audio stream to play, select a particular audio stream to save as an audio file or to select the audio streams to save when re-saving a video file that contains multiple audio streams. Ability to slow down or speed up playback, with support for a wide range of speeds (from x0.01 to x300.0). Schedule playbacks or recordings using Total Recorder's powerful built-in scheduler. For example, you can schedule a recording from your favorite streaming video services and websites, such as YouTube, or record screen activities on your PC. Refer to Using the Scheduler for details. Support for video files with multichannel audio streams, provided that an appropriate audio codec is installed. For example, Total Recorder can work with video files that contain audio streams in Dolby Digital (AC3) format. You can use the predefined sample links provided with the product, or you can add a video file or URL to your Total Recorder Favorites list for later access. Favorites can be exported and imported. Extract an audio or video stream from a video file. Replace an audio stream in a video file or add an audio stream to a video file. Save a video frame as a bitmap (.bmp) file and copy the current frame to the Clipboard so that you can paste it into another program such as a graphic editor or a word processor. These are only some of the features of Total Recorder VideoPro Edition. For more information, refer to the program's help or the PDF-documentation. You can download tr86ve.exe and run it to install the no-cost evaluation version of Total Recorder VideoPro Edition. The evaluation copy is a fully functional version of the program with the exception that an audible noise will be inserted about every 60 seconds throughout each recording you make, a mark is added to captured images when recording video, and no more than three files can be processed in batch. For unlimited use of Total Recorder, you must purchase a Total Recorder license. All registered users of Total Recorder Professional Edition with the Video Add-on can upgrade at no charge to Total Recorder VideoPro Edition. To update your version of Total Recorder, please download the latest version of Total Recorder and install it on the top of the existing install. Registration information for the Video Add-on is valid for Total Recorder VideoPro Edition. For a limited time only, licensed users of Total Recorder Standard Edition or Professional Edition can upgrade to the VideoPro Edition for an upgrade fee of $36.00 and $18.00 US respectively. Registered users of the Standard Edition should use this link to upgrade to the VideoPro Edition. Users of the Professional Edition should use this link to upgrade to the VideoPro Edition. When you upgrade, the installation of the VideoPro Edition will remove the previous version of Total Recorder from your PC. If you evaluate the VideoPro and decide not to purchase it, you must re-install the Standard Edition or Professional Edition and specify your registration key. Your registration key for the Standard Edition or Professional Edition cannot be used for the VideoPro Edition. DirectX version 9.0 or later (you can download the update version of the Direct X from the Microsoft website). If you are interested in recording screen activity or recording streaming video, Total Recorder VideoPro Edition is worth a try.